For viewing and logging MODBUS RTU communication, connecting and configuring your intelligent sensors, data logger and SCADA systems. Free trial is available for download below. Log and save MODBUS RTU communication in text file format. Table data on the left provides a quick look at the current Modbus register values and lets you specify your own register alias names. Right (green) side of the user interface displays data trends graphically so that you can quickly see how data changes in real time. Zoom and pan the plot to view the data as it changes. Set minimum and maximum axis values or let the plot automatically pan to keep the latest data visible. Preform all of these functions in real-time as the plot updates with the latest data. Multiple Modbus channels function lets you interface with many different Modbus registers simultaneously. Select which data to log into an external text file in .CSV format so that is can be easily be opened and edited in Microsoft Excel. Use the setup screen to configure which data to log, logging interval and scale factor for each Modbus register. Save the entire configuration to file for later use. As shown in the screenshot, multiple BARANI DESIGN sensors can be simultaneously configured using this utility to make working our with MODBUS sensors a breeze. To access multiple Modbus RTU devices simultaneously, all the devices have to be configured to use the same baud rate, comm port, stop bits, and parity. Easy MODBUs Viewer uses standard Modbus Serial RTU protocol. Cyclical redundancy checking is used and reads 16 bit Modbus register values. Reading of 32 and 64 bit values as integers and floating point values is available. Less common applications will use swapped register values or values requiring byte offsets, please contact us for customization. Rather than limiting the user to a specific configuration, a wide range of settings are allowed in this software. No set limit on the number of register channels that can be read from Modbus slave devices. Logging to CSV files at speeds of up to 250 ms. Under certain conditions, if logging speed is faster than than the speed of serial communication, duplicate values will be logged, and the data table background (left side of screen will turn yellow. Many types of serial hardware types are available and can be used such as RS232, RS485, ect. Please make sure you have the correct type of hardware for the device you are trying to read. We recommend FTDI chip based hardware for serial communication over a USB port. Not all hardware is equal and we have good experience with the USB-COMi-M usb-to-serial converter from Serial Gear. This device is reliable, configurable for most serial data types, and has LEDs for transmit and receive troubleshooting. Other serial converters will also work. What Modbus software features are you looking for? To download the free trial of Easy Modbus Viewer without providing us with the info above and feedback, please click here. After submitting the form, you will be navigated to a download link containing a zip file for the trial version of the program. Unzip the file and run the setup file inside. 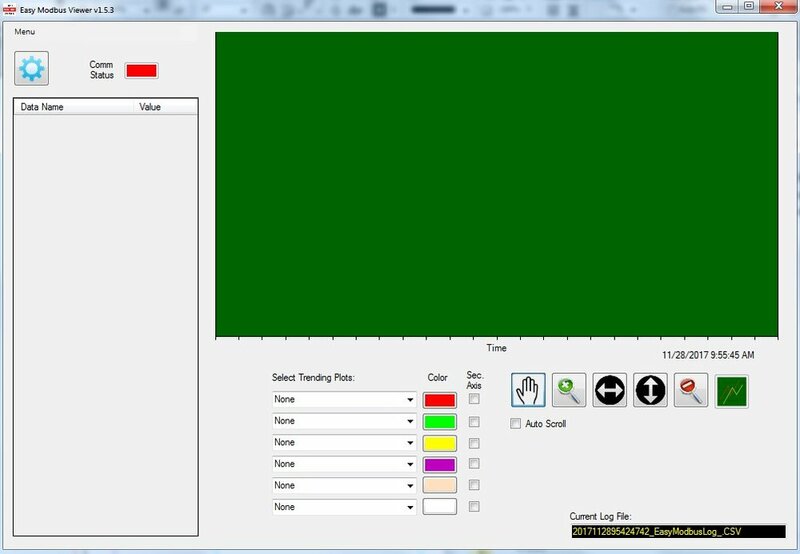 This trial version of Easy MODBUS Viewer is for evaluation purposes only. The trial version is a full featured version of Easy MODBUS viewer that will automatically close after 10 minutes of runtime. You may re-run the trial version as many times as you like.